The Cebuana Lhuillier 24k Card will rewards clients with the 24K Card benefits. For every Php20 service fee paid at Cebuana Lhuillier, the cardholder earns 1 point or Php1 which they can spend without having to worry about Card Expiration or Renewals. Just Fill out the Cebuana 24K Card Application Form and submit to any Cebuana Lhuillier branch. Bring your your valid ID when you apply for the card. e-load for Globe, Smart, Sun, and Bayantel prepaid landlines and Internet, and bills payment. Pay for tuition fees at Jose Rizal University and Mapua Institute of Technology. Make Donation to GMA Kapuso Foundation or The Philippine Red Cross. Convert their Points to Rewards Coupons that can be redeemed in partner establishments including The Generics Pharmacy, Mister Donut, Banana Peel, Just Jewels, Orchard Road, Le Soleil Boracay, Phiten, Chooks to Go, and more. Buy Products and Services online using their points through Group-Buying sites BUYanihan, Megadeals, and Sulit.com. Clients can now also use their Mobile Phones to check the Status of their Loans, Remittances and more. 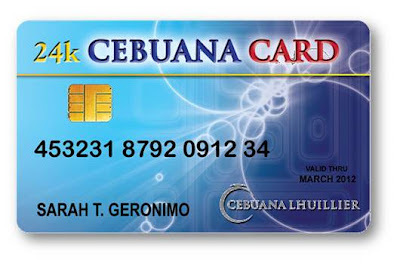 For more details about Cebuana Lhuillier 24K Card visit www.cebuanalhuillier.com website. Cebuana Lhuillier Insurance Solutions, Inc. (CLIS), now seeks for the Happiest Pinoy for 2012 through Cebuana Lhuillier's Happiest Pinoy Search which recognizes the country’s most optimistic and passionate Filipinos who overcame difficulties and exhibited resilience amid life’s challenges, without losing their cheerful attitude. 10 finalists will be chosen, but only one will receive the title of Happiest Pinoy 2012 and a PhP250,000 cash prize plus Trophy while P25,000.00 each plus Trophy for the 9 runner ups, tax-free. Winston Maxino, is Cebuana Lhuillier's Happiest Pinoy in 2009, Winston Maxino from Dumaguete portray values of optimism, hope and resilience in times of strife, bringing inspiring stories and outstanding citizens. Maxino won the Happiest Pinoy 2009 for being an optimistic but sharp corporate executive despite being diagnosed with Ankylosing Spondylitis, Osteoporosis, Asthma and Uveitis. Ms Mel C. Tiangco, Chief Operating Officer, GMA 7 Kapuso Foundation, Inc. Secure on-line nomination forms and upload entries to www.happiest-pinoy.com. Send accomplished forms to Cebuana Lhuillier Insurance Solutions (CLIS) Head Office, 821 A. Spring corner J.P. Rizal Streets, Makati City. 2 comments: on "The Search for The Happiest Pinoy and The Cebuana Lhuillier 24k Card"